A major impact on the energy consumption and CO2 emissions is related to the efficiency of the heating and/or cooling system, its efficiency on production, emission, control and distribution. Conventional systems used in Passivhaus buildings must have a high performance level, should have low levels of emissions and primary energy consumption. The energy consumption of a building can be expressed in terms of equivalent consumption in primary energy — Tons of Oil Equivalent — or in terms of CO2 emissions. However, the conversion factors are country dependent on the energy mix and the way the energy is generated. Renewable energy is favourably a good choice. The adoption of high-efficiency appliances can significantly reduce the total energy consumption. Whenever possible the design should rely on daylight and minimize the use of artificial light. Although inefficient appliances can help reduce heating loads in winter, this is a very inefficient way to heat a house. Also, internal gains from inefficient appliances increase summer cooling loads and the overall net energy balance is usually negative. There are simple and effective passive strategies that minimize or reduce the energy consumed. Adopting them depends mainly on the occupants’ behaviour. Using the washing machines during night when the energy demand is reduced and cheaper, drying the linen in the sun instead of in a tumble dryer, switching off appliances instead of relying on standby mode are just a few examples. The impact of the five different south-facing curtainwall facade scenarios described in Table 2 on a building heating and cooling load was studied for the three cities identified in Table 1. For each scenario, the curtainwall was assumed to consist of 50% of a multi-layer glazing system as a vision section, and 50% of either spandrel panels or multi-glazing BIPV assemblies as the non-vision section. All the multi-layer glazing systems (with and without PV) were assumed to have low-e coating, 6mm glass panes, 20mm air cavities and aluminium framing with 19mm thermal break and insulating edge spacers. The vision sections characteristics were obtained with FRAMETMplus  using the curtainwall framing system. The U-value and SHGC were evaluated at 2.03W/m2oC and 0.39 for the double-glazed system, and 1.2 W/m2oC and 0.28 for the triple-glazed system. Table 2. South-facing curtainwall facade scenarios. The systems have been monitored since their installation at June 2005, for the facade, and December 2005, for the park. Fig. 4 presents the values of the monthly averages of the daily energy produced in the facade, per installed peak power. In general, this system produces more energy in winter periods with a maximum average daily production of 47.3 kWh at November 2007. The production minimum occurred at June 2005 with a daily average production of 20.2 kWh. Fig. 4. 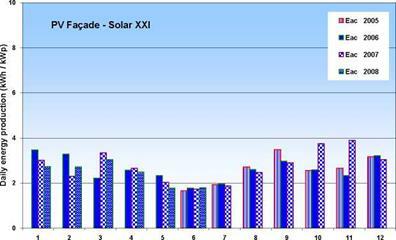 PV facade — Monthly average of the daily energy produced, per installed peak power. 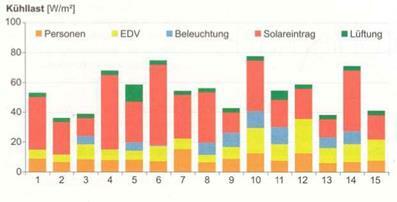 At Table 3 we present the yearly irradiation and yearly energy produced by PV Facade system. The average yearly irradiation measured in the vertical facade, is about 1 155 kW/m2 and the energy production is about 977 kWh per kW of peak power installed. Table 3. Yearly energy produced by PV Facade system, per installed peak power. was to integrate a PV surface larger than the functional product in such a way that it can optimally convert energy and users can conveniently use the product. The final product design is a mobile device that is highly energy efficient. The target group consists of users that have a modest demand for functionality and thus energy consumption. 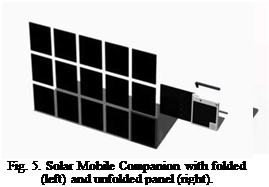 The PV panel is foldable and detachable. Folded, the panel is small enough to fit in the cover of the device. When detached the panel can be left to charge its own battery on a location with high light intensity. The main device can be used on a different, darker, location. As soon as the panel is connected to the device again, the energy stored in the panel’s battery is transferred to the device’s battery. A tangible model was made of the product. The final design is a concept, a showcase. It is estimated that the design is technically feasible in terms of technology by the year 2010. The first and often most difficult stage of planning a solar cooling plant is to calculate the actual cooling demand. 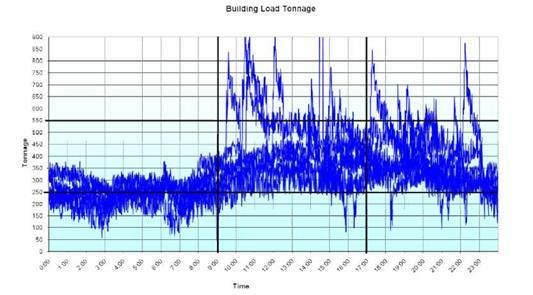 Norm calculations usually give the sum of multiple single peak loads resulting in a very high overall peak load. This demand however will only be required for a very small number of running hours. This explains why electrical cooling machines are mostly over-sized and therefore have to continuously modulate. This unstable operation leads to lower efficiency levels and unnecessarily high power connections. If a solar thermal cooling plant was to be designed based on these peak loads, the plant would not only be very expensive, the over-sizing also leads to operational problems. Table 1: Overview of the thermal cooling plants already operational from S. O.L. I.D. All of the cooling projects for air-conditioning purposes were over-dimensioned by a factor of 2-3 during the initial design phase. According to the DIN, the EAR Tower in Pristina had a cooling demand of 210 KW. The actual cooling system installed by S. O.L. I.D. uses two cooling machines with a total nominal capacity of 70 KW (peak 90 KW) and a back-up 30 KW compression cooler. The maximum measured cooling demand over six summers (including the particularly hot summer of 2003) was 80 KW. Same has been monitored on all other projects. The influence factors on the cooling demand are as well as people, IT equipment, lighting and ventilation, most notably passive solar gains. A realistic estimate of the cooling demand requires further experience or a simulation programme. The cooling demand also varies considerably depending on ventilation, in particular rates of air change and heat recovery installations play a big role. For air conditioning in office buildings, a ratio of 12m2 collector area per 100m2 of office area to be cooled has proven to be relatively accurate. Larger collector areas are necessary only in extreme climates with high cooling demands at night. and 99% of the time lower than 30%. mostly between 250 and 500 tons. The classification of fa? ade systems by “morphological” aspects, i. e. form, dimension, construction, material, function etc. led to a great variety, (23 parameters and up to six variations per parameter in the morphological box). The number of classified solutions could dramatically be reduced, if only the physical properties were considered, which had an influence on the energy demand. It was possible to reduce the 23 parameters to six energy relevant parameters: window/fa? ade (Awindow), mean heat transmittance of fa? ade (Um), heat gain coefficient of glass (gG), heat gain coefficient of shading devices (FC), light transmittance of glass (TL), equivalent air change rate (neq). For each parameter there are defined five equidistant values, the bandwidth between lowest and highest value given by minimal building standards and best practice solutions (Table 1). In total there were 15,625 facade combinations to be simulated by TRNSYS for each of the (four) major fa? ade orientations. All simulations were carried out under the same boundary conditions, such as office floor plan and weather data. Villa Zagala is located at 34.6° South, 58.5° West, and 26 m over sea level, in “Great Buenos Aires”. There are neighbouring buildings, such as a hospital and a geriatric house and a church that conditionates the orientation of the new building. The climate variables in winter and summer are shown in Table 1. The outdoor air temperatures and wind velocities were obtained from the National Meteorological Service and the mean solar irradiance on horizontal surface was estimated from correlations (Righini et al., 2004). Table 1. Meteorological data of Villa Zagala, for a winter (July) a summer (January) month. The floor view and two facades are shown in Figures 1 and 2. The original project was a conventional design commonly used by the Ministry of Social Development (MDS) team in these buildings with slight adaptations depending on the site. Due to functional reasons, the CIC building is divided in two independent sectors, named Health and Development, with a covered area around 325 m2 each one. The Health Sector has a large vertical surface oriented to North in order to maximize the solar collection. Originally the vertical envelope was a plastered hollow ceramic wall (0.18m thick), with indoor partitions of 0.15m thick hollow ceramic bricks. The roof was a metal sheet with a gypsum ceiling. This project was modified in order to minimize the thermal losses through the building envelope by improving the thermal insulation of walls and roofs with a polystyrene sheet (0.05m thick), the subfloor with insulating aggregates and double glazing in windows. Reduction of the air leakages through the opening frames, avoiding overheating in summer through solar control devices as overhangs, shading devices, etc., forced and natural ventilation, and daylighting, were also included. Solar and low-energy devices as solar water heating, photovoltaic panels, and low-energy consumption lights, will be installed in the building. First of all, the collector can be regarded as a fa? ade collector with its typical advantages, disadvantages and special aspects to be considered in order to be designed properly. One of these important aspects is the minimum backside insulation [3, 4] to prevent the room from overheating. 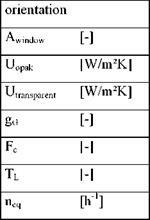 In the case of the semi-transparent collector these minimum insulation requirements have to be fulfilled by the inner glass pane(s). Depending on the efficiency of the collector and thus its temperature level, it will be necessary to use a double glazing with Low-E coating as “backside insulation” or multi­layers of transparent foils . Another important topic will be the effect of the openings and the position of the absorber on the natural convection within the collector and thus on its efficiency. 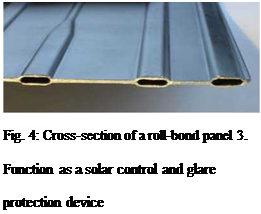 In order to have a high flexibility concerning the absorber channel design as well as an aesthetic appearance, roll-bond absorbers (Fig. 4) seem to be a good choice for this type of collector. In conventional absorbers, the heat transfer direction from the absorber surface to the next channel is basically perpendicular to the channel direction. In the case of an absorber with a three-dimensional structure it has to be considered that the heat transfer distance to the fluid is increased and the cross section is reduced: The sides of the lamellae (bent to outside) are not in contact with the channel; therefore the heat transfer is only possible via the remaining flat areas of the absorber which are connected to the channels. The advantage of roll-bond absorbers is the fact that their channel distance can be reduced without additional costs. It can be expected that smaller channel distances will compensate for the lower heat transfer of the three-dimensional structure mentioned above and thus lead to high collector efficiency factors F’ anyway. 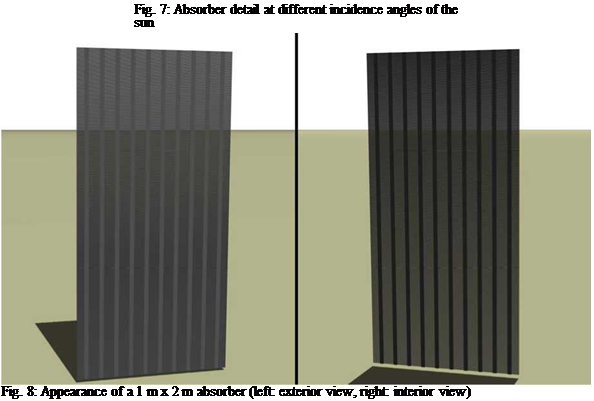 Moreover, for large sun elevation angles the incidence angle modifier (IAM) of the lamellae should be higher than for a flat vertical absorber. This could be beneficial for solar gains in summer in order to drive a solar cooling system. Roll-bond technology also offers the possibility to realize optimized channel arrangements such as fractal-like, multiply branched FracTherm® structures which lead to a low pressure drop as well as a uniform flow distribution [5, 6]. Even non-rectangular shapes can be used, which might be interesting for architectural reasons. Variant b) features better daylighting behaviour, but poor absorption, solar control and glare protection. Variants c) and d) can be regarded as compromises of a) and b) with different focuses. In Fig. 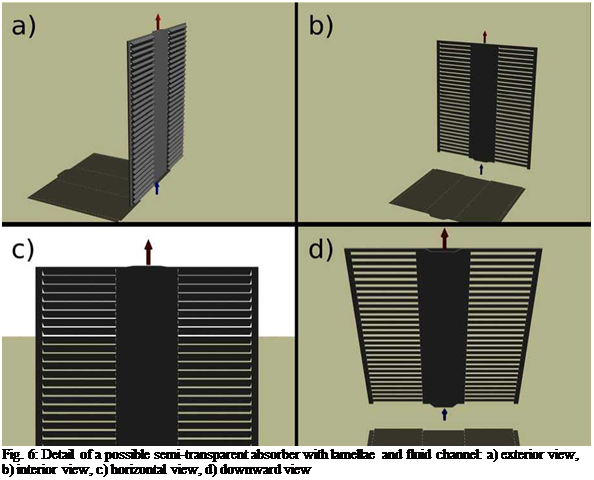 6 different views of a detail of a possible semi-transparent absorber with lamellae and fluid channel are shown. The size of this small part is only about 128 mm x 150 mm. The exterior view in a) gives an impression of the absorber seen from outside, whereas the internal view in b) shows the appearance from inside. It can be seen that for the assumed sun elevation angle a homogeneous shadow is formed (without light stripes from the openings). View c) and d) show how the effective transparency changes with the angle: only small slits appear if one looks through the absorber horizontally, but they seem to become bigger if one looks downwards. This effect is especially interesting for multi-storey buildings. Fig. 7 shows the absorber detail at different incidence angles of the sun. In the raytracing simulations the absorber was oriented towards south and the solar azimuth angle was always 0. It can be seen that even for small incidence angles the shadow is homogeneous. Fig. 8 gives an impression of the appearance of an absorber with an area of 1 m x 2 m and its shadow. In this case parallel, vertically oriented channels were assumed. However, other channel designs are also possible. Only a overhang solar shading type has been considered. The TMY weather file used is the one from Saint Pierre, a town located in the south of La Reunion. The classroom has been divided into three equal strips. The daylight factor and the illuminance level have been calculated for each strip. The differences between the values of HDD and CDD obtained from the different of measurement sites (urban and rural stations within MMA and the local weather station at the airport) were calculated. These differences were expressed as percentages in order to quantify the error’s magnitude incurred in the calculation of the studied variables when not considering the effect of the city on the local climate. The results show that during summer time there exists an underestimation in the cooling demand calculated from the data obtained by local weather stations that oscillates between 6% and 43%. For the winter time, it happens oppositely, an overestimation of the heating load that represents an error from about 19% to 50%. In the case of the air temperature behavior in downtown respect to its surroundings, it is observed that the demand for cooling in the downtown area is higher than 12% and up to a 130% respect to the surroundings demands, depending on the month of a year and the zone of the city analyzed. The demand of heating for downtown area respect to the environs is smaller in the order of 25 to 62%.The energy requirements of the suburban and rural zones of the city respect to the values calculated from the local weather station show an overestimation of 4% to 41% of the cooling necessities, and an underestimation of 2% to 32% in the case of the heating demand. Figure 3 shows the yearly distribution of HDD and CDD within the AMM. The degree day’s distribution responds clearly to the thermal behavior and to the climatic conditions that prevail in the city. During the summer the radiation levels are high, for this reason the materials that compose the ground of the city’s out-skirts, which are mainly rocky, accumulate heat during the day, homogenizing the distribution of temperatures between downtown area and the city’s out-skirts of the. This does not happen in winter due to the lesser amount of radiation during the day, increasing the temperature differences between downtown and the rural areas. The greater demand in refrigeration during the month of December can be explained by the increase of the anthropogenic contribution in the city, because this is a festive month, whereas January and February are months of vacations. The maps that show the distribution of heating and cooling degrees-day within the AMM always display a hot zone of greater demand of refrigeration and minor demand of heating coincident with the administrative-commercial zone in the city.